Simple yet sophisticated, this beautiful five-piece dining set enhances your outdoor entertaining experience. 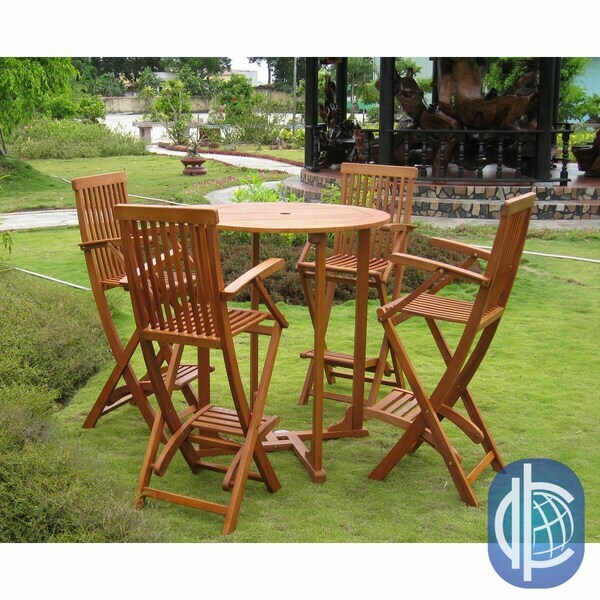 Constructed of teak wood and finished with a gorgeous natural wood finish, this fantastic dining set is weather- and UV-resistant, allowing you to enjoy this wonderful set throughout the years. This lovely bar-height dining set includes four chairs, which fold for easy set-up and storage. Assembly is difficult there were too many pieces and not good quality for outdoors. Returned this item. This product arrived early compared to the timing stated on the original shipping expectations. While the product looks great putting the table together was terrible since the metal inserts needed to put the legs on the table did not fit the holes that were pre-drilled into the leg supports. I had to purchase a drill set so that I could enlarge the holes in the leg supports and insert the screw supports. This was time consuming and costly. I have not had problems with the slats falling out but I have only sat on it once. I did have to tighten all of the screws on the chairs after I removed them from the box. Great product to look at, but dont use! All four chairs came apart at the seat...the table as fine. It was good for the 1st summer. I put away in the garage in the winter months but the slats came apart and two of the chairs were rendered useless by the second summer season. "can you buy JUST the tall table?" Unfortunately no, this is only sold as a set.